On Palm Sunday, our faithful gathered to celebrate Christ's triumpant entrance into Jerusalem. Also, our First Confession class made their first confesisons and were given commemorative gifts following the Divine Liturgy. 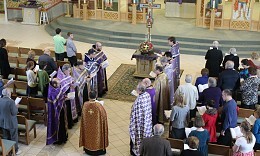 Scenes from Holy Week at our parish. On Lazarus Saturday, after Divine Liturgy, our Jr. 'R' Club gathered for their annual church cleaning. 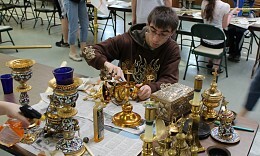 Everyone pitched in to sweep the floors, wosh the windows, and polish the brass. 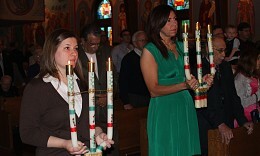 Thanks to them, the church was sparkling for Palm Sunday and Pascha. This afternoon almost 30 parishioners from St. Michael's drove down to St. Herman's House of Hospitality for Vespers and to serve dinner to the area needy. Today, members of our parish took a field trip to the Cleveland Museum of Art. 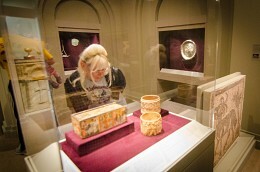 The museum houses many Christian artifacts from Greece, Constantinople and other places some dating back to the first few centuries. 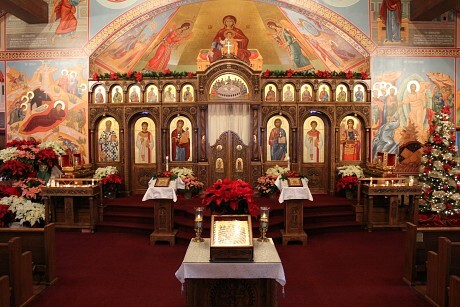 Today, on the third Sunday of Great Lent, the Cleveland Deanery gathered at Holy Trinity Orthodox Church in Parma, OH for the Akathist to the Holy Cross. 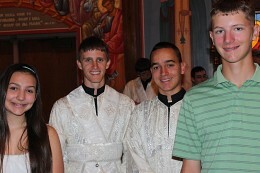 Twelve priests served, and almost 200 parishioners from the area were present. A Leneten meal was served afterwards for all to share in. 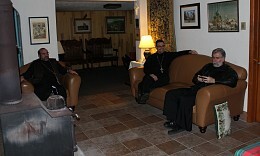 The Cleveland Deanery clergy met at St. John the Theologian Monastery in Hiram , OH for their annual Lenten Clergy Retreat. 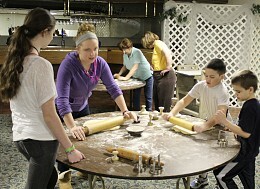 This weekend on Friday and Saturday, volunteers spent many hours making pirogis from scratch. 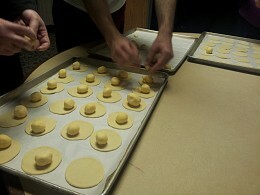 Almost 100 dozen pirogis were made and then sold at coffe hour on Sunday. 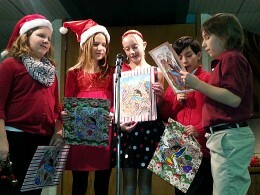 All of the proceeds went to St. Herman's House of Hospitality. Tonights, our Jr. 'R' Club hosted its annual Poor Man's Reverse Raffle. Over 150 people attended this fun and exciting event. 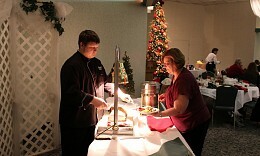 A delicious stuffed-pork chop dinner was served during the festivities. Today, our parish held its Annual Parish Meeting. Click the gallery for more images. 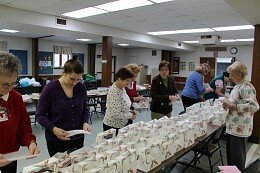 Our parish took advantage of the Martin Luther King Jr holiday and held a prosphora making day. With the schools being closed in honor of the holiday, many of our parish youth were able to come and help make prosphora. It was a learning experience and also a chance to socialize. 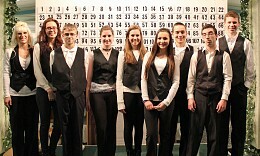 Members of the Jr. R Club attended a bowling event today. 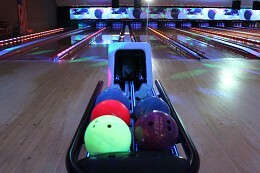 Over 20 youth and their parents turned out for glow-bowling fun! 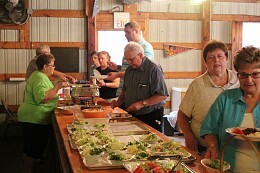 Today, our parish hosted a stuffed cabbage dinner fund-raiser. The dinner was open to the public, and within the first hour the stuffed cabbages were sold out! The dinner was a delicious success. A few times a year at St Michaels, we like to let our church volunteers know how appreciated they are. Tonight, we had a wonderful prime rib dinner with all the fixings. 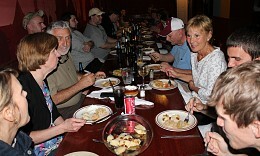 Our volunteers were treated to a wonderful night of food and fellowship. We hope to see you next time. Theophany and the Great Blessing of Waters. Volunteers stay after the Twelve Passion Gospels to set up the Lord's Tomb. The Feast of Feasts. 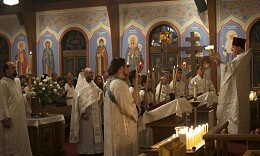 The Great and Holy Pascha. 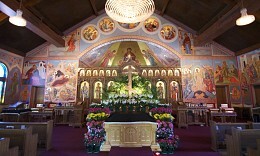 Celebrated at Archangel Michael Orthodox Church. A group of Parishioners headed down to Nicky's Cafe in Parm on Friday to celebrate Bright Week with some traditional Ukrainian food and drinks. 2013 Mother's Day. Liturgy and Banquet. 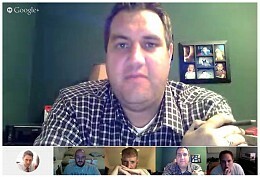 Our Communication Committee (ComCom) met via Google Hangout Tonight! 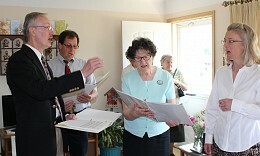 A small group of our Choir went after Litrugy to see an ill parishioner, Mary Chychlyk. 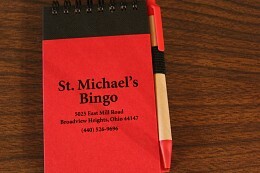 Mary is a long time member of St. Michaels and loved by all. It was an uplifring afternon both for Mary and the Choir. Today we honored all Sunday School, High School and College graduates. Congratulations to all of you! Today our parish honored all fathers, grand fathers and godfathers by having our annual keilbassa cookout down at The Shanty. Today St Michaels honored Marianne Kormos in recognition for her 40 years of service and a Sunday School teacher. 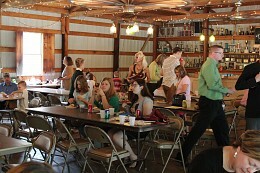 A luncheon and social was held after liturgy. His Beatitude, Metropolitan Tikhon visited our parish for the vigil of the feast of Ss Peter and Paul. It was His Beatitudes first visit to our parish. He inscribed a blessing into the Gospel Book on the altar of the church. Scenes from the FOCA National Convention held in Cleveland Ohio and hosted by our Cleveland R Club. For full galleries visit https://www.facebook.com/ClevelandRClub/photos_albums. Fr. John, Fr. 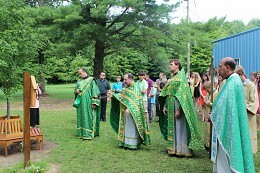 Joseph and other area clergy gathered at St. Vladimir's Summer camp on the Patronal Feast Day of the camp to serve the divine liturgy. After the service, the camp was blessed and a panikhida was served at the Archbishop Job Memorial Shrine, for the late arechbishop who used to visit the camp and spend time with the campers. 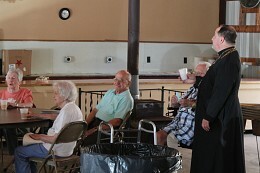 On the feast day of St. Herman of Alaska, area clergy gathered at St. John the Theologian Monastery in Hiram, OH to bid farewell to the monks. Fr. Alexander and Fr. Daniel are relocating to a monastery in the Ukraine at the end of the month. 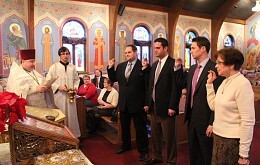 A handful of lay people also gathered for the Divine Liturgy. 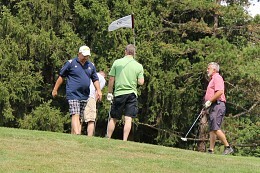 Photos from this year's parish golf outing. 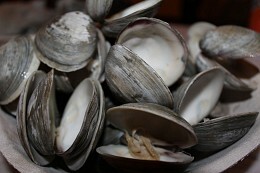 Today the Cleveland 'R' Club sponsored a Clam Bake to benefit St. Vladimir's Summer Camp and Retreat Center. Today after the Divine Liturgy we had our annual Sunday School Picnic and registration. 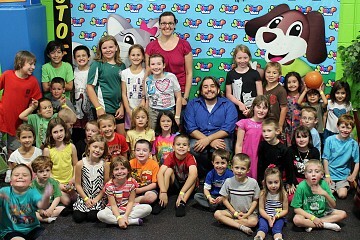 Sunday School students and their parents enjoyed pizza, subs and an assortment of carnival style games to kick off the new Sunday School year. Our volunteers are hard workers. We appreciate them. If you are interested in volunteering we would love to have you. Today our Sunday School year began. Students, parents and teachers gathereed for a prayer service asking God's blessing upon all of them and their studies. After the moleben, students went to their classrooms for their forst day. 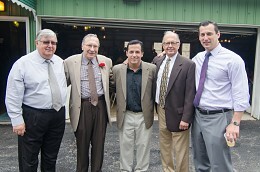 Photos from our 55+ CLub's trip to see the "Rat Pack". 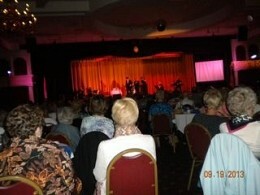 Members enjoyed an afternoon of nostalgia and fun, as they as they listened to the Rat Pack impersonators. Tonight our Preteen Club kicked of f the new year with an outing to The Jump Yard in North Royalton. Over 40 children from St. Michaels and other Orthodox parishes in the area bounced the night away and munched on pizza and soda. Our Preteen Club meets twice a month, and is a great opportunity four our youth to make friends in the church. Hope to see you at the next meeting! Today the faithful of St Michael's visited St Herman's House of Hospitality in Cleveland for vespers and to help serve dinner to the area needy. 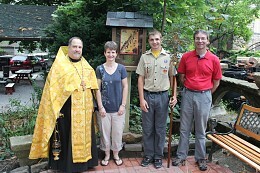 In addition, after vespers, Fr John and the faithful processed out to the courtyard of St. Herman's to bless a set of icon shrines crafted by parishioner, Thomas Rigby, as part of his Eagle Scout program. The icon shrines are beautifully crafted and will serve as a prminder of prayer for all of those who visit the House of Hospitality. Well done Thomas! Tonight, St. Michael's hosted the 4th Annual Fr. Prislopky DInner Lecture. 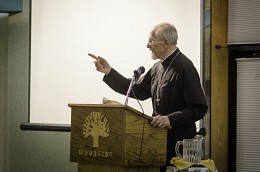 This lecture series was began as a memorial to the beloved late pastor of St. Michael's - Fr Vladimir Prislopsky. 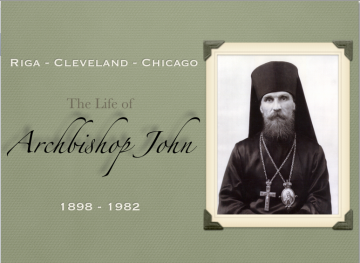 This year's topic was "Riga - Cleveland - Chicago: The life of Archbishop John". The talk was given by V. Rev. 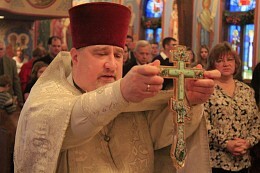 Alexander Garklavs, who is the grandson of the Archbishop John. All who attended left feeling a little more connected with this late archpastor. Today after Divine LIturgy, the Jr. R Club hosted its annual Halloween Brunch. All Proceeds go to benefit the Christmas Stocking Project. 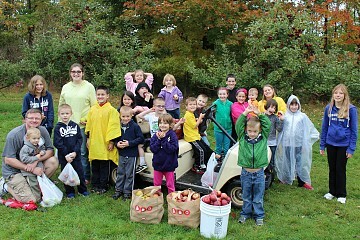 Photos from our Sunday School's field trip to Heavenly Hills Apple Orachard in North Royalton. Although the weather was a little wet, we had almost 25 children from our Sunday School come out to have an afternoon of fun hayrides, cornmazes, bounce house and apple picking. Hope to see you on the next field trip! Our seasoned pirogi pinchers gathered Thursday and Friday to pinch and boil 200 dozen pirogis to be sold at our annual craft sale in the gym. Thanks to all of our hardworking volunteers. See you next time. 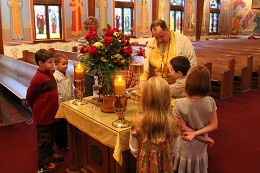 Fr John prays the Proskomedia service and explains it to the first grade Sunday School class. 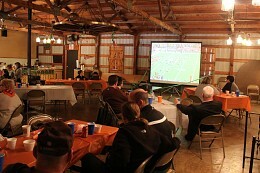 Today after Liturgy, the Cleveland R Club hosted its Annual Cleveland Browns Tailgate Party at the Shanty. Although the Browns lost, a good time was had by all. On Monday night, Focus North America hosted a fundraiser at woodside Party Center to benefit St. Herman's House of Hospitality in Cleveland. 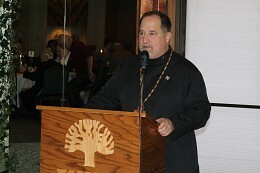 The keynote speaker for the evening was Fr. Thomas Hopko. Today we celebrated the patronal feast day of our parish. 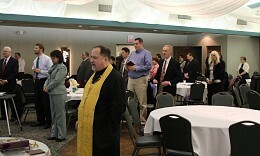 Divine Liturgy was served and attended by area faithful and clergy. 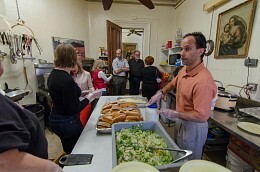 After the Liturgy, a luncheon was held back at Woodside. As part of our parish tradition, the Sunday following the feast day of the Archangel Michael the parish hosts a St. Michael's Day Banquet after the liturgy. Below are some photos from the event. 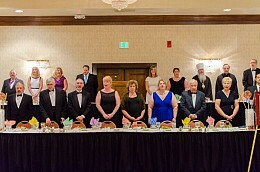 The Cleveland area Eastern Orthodox Women's Guild met at St. Michael's Woodside Party Center tonight. 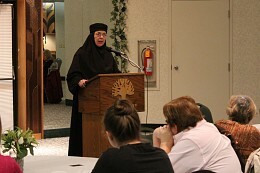 The guest speaker was Mother Magdalena from Holy Transfiguration Monastery in Ellwood City, PA. The topic of the talk was Death and Resurrection. Each year before Christmas, our Samaritans group holds a cookie drive. 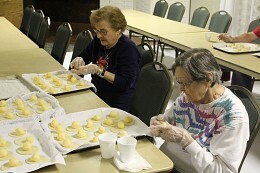 Parishioners from St. Michaels bake cookies and drop them off at the church. Today, in addition to the monthly moleben for the sick and the suffering, the Samaritans boxed the cookies up and labeled them. Over the next week, the cookies will be delivered to parishioners of St. Michaels that are homebound, or who live in nursing homes. Our parish's annual food drive for St. Herman's House of Hospitality wrapped up today with enough donations to fill two vehicles! 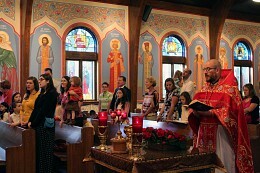 THe donations were delivered to St Herman's this afternoong after the Divine Liturgy. May God reward the generosity of all who donated. 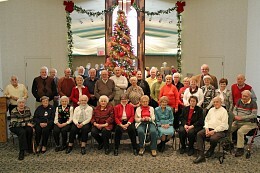 Today the 55+ Club held their annual Christmas Party. Click the slideshow to see the pictures. 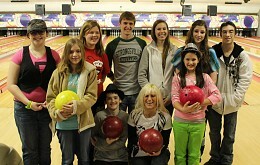 Photos from the annual Jr. R Club Bowling Party.